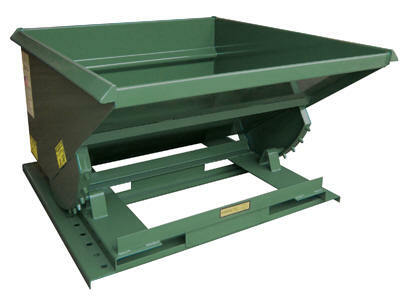 All welded Self-Dumping Hoppers handle bulk materials and scrap easily. Must transport and dump with a forklift or make the unit mobile with the optional casters. 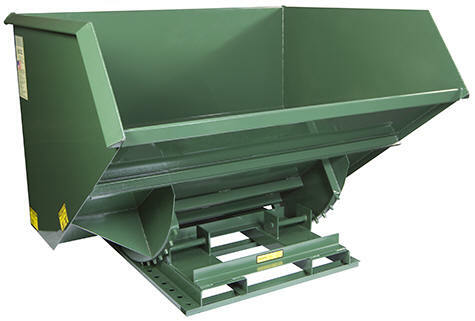 Self dumping hoppers are engineered to dump when the safety latch is tripped and to return to an upright locked position when empty. All units come with safety retaining chain and a trip rope assembly. 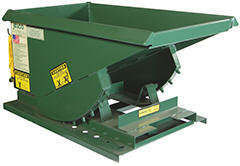 The 1/4 to 2 cubic yard hoppers have a formed stackable base (stackable when empty). 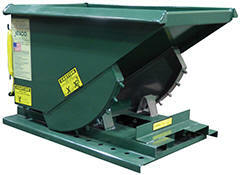 The 3 to 5 cubic yard hoppers have structural bases with re-enforced rockers for heavy use. 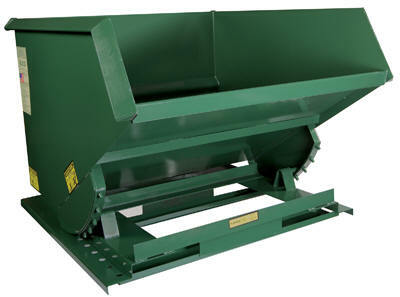 Options include: casters, lids (1 to 2½ cubic yard), lifting lugs, and paint colors. Paint finish is vista green. Must be attached to fork truck when dumping. Single hinge in the center, but both front and back lids can be opened. * Unit is NOT stackable at any time, empty nor full. (add suffix to model #) Wt.